Only citizens of certain countries can visit Vietnam without an entry visa. Only passport holders of some certain countries can visit Vietnam without a Vietnam entry visa for a regulated period. There are some regulations: You need to have tickets for boarding transportation, to return or travel to another country, within the period. And that you are NOT in the list of persons not permitted to enter Vietnam. 30-days visa exemptions: Cambodia, Malaysia, Indonesia, Singapore, Kyrgyzstan, Thailand and Laos. 15-days visa exemptions*: Uk (British), France, Germany, Italy and Spain. The agreement is renewed yearly and valid until 30th June 2017. Note: * Certain visa exemptions are renewed yearly or within a period of time. Visitors travel close to these dates, are advice to check for updates. This is the renewal issued by the government. Note: Visitors using visa exemption cannot re-use the exemption within 30-days after last visa-free exit. Citizens of France holding valid diplomatic or official passports are not required to have visa for less than 90 days or several visits within 6 months. Citizens of Chile holding valid diplomatic or official passports are not required to have visa for less than 60 days. APEC Business Travel Card (ABTC) Holders from Asia-Pacific Economic Cooperation (APEC) member economies are not required to have visa for less than 60 days. For those who travel to Phu Quoc Island - Vietnam : Foreigners and Vietnamese, holding foreign passports which enter Vietnam through an international border gate and then travel to Phu Quoc Island and stay in Phu Quoc less than 15 days, will also be exempt from a Vietnam visa application. Passports must be valid for at least 45 days. After arriving in Phu Quoc Island if visitors want to travel other localities or stay in the island for more than 15 days, the Vietnam Immigration will be responsible for issuing visas right on the spot. No visa required for Vietnamese overseas for less than 90days stay if holding a Vietnam visa exemption certificate. All other citizens are required to get a Vietnamese entry visa before departure (Vietnam visa issued prior to departure by Vietnamese consulates or embassies) or a pre-approved Vietnam entry visa (visa is issued on arrival at Vietnam’s International Airports) at Starvietnamvisa order visa online. 2: Applying online at StarVietnamVisa for a Vietnam visa on arrival (Get your Vietnam Visa approval letter before you go and pickup the Vietnam visa at a Vietnam international airport within 1 or 2 working days). 3: Pre-arranged Visa code at embassy. Similar to visa on arrival, but you get the visa stamp at teh embassy. Apply visa online on our website, get approval letter and a fax copy from the immigration dep., get the visa stamp at the pre-chosen embassy. Read more on visa code! It is required that you obtain a return ticket or documentation that you will exit the country within the period. In addition, you can not be in the list of persons not permitted to enter Vietnam. If you are not sure, or don’t know the specific date when you are going to leave the country we advise you to apply for a Vietnamese Visa. Almost all nationalities need an Entry Visa to Vietnam except some included in the Vietnam visa exemption list. We try to keep you updated, but you need to check with your nearest Vietnamese embassy or consulate for updated information. Please have a look on the official government website for more information. You are welcome to contact us through e-mail or chat for requirements or you can contact the Embassy for further enquiry about any exemptions. Is "Visa on Arrival" legitimate and safe? Yes, it is. It is the same valid and leagal as regular visa, but not issued by the embassy. Visa on arrival is officially issued by the Vietnam Immigration Department (Vietnamese Government) through an agency, and therefore it has the same validity as the visa you get from any Vietnamese embassy abroad. "Visa on arrival" is stated in the Immigration Laws of Vietnam Article 24, 1999, clause #6, Chapter II. Vietnamese visa on arrival is only available when applying through an official agency. It cannot be applied direct at the Vietnamese Immigration Dep. privatly without an agency and its guarantee for your stay (ref. (National Ordinance No. 24/2000/PL-UBTVQH10, article 5) ). Vietnamese visa on arrival is a pre-arranged visa to get the visa stamp when landing in Vietnam. It is not granted by the Vietnamese embassy, but direct by the Vietnamese Immigration Dep. through an official agency. There are some misconceptions about Vietnamese Visa on Arrival (VoA). It is not issued or granted by the Vietnamese embassy and therfore it cannot support or guarantee for this service. It is the Vietnamese Immigration Dep. who grant and issue the visa on arrival. They guarantee for your entrance directly. Visa on arrival cannot be applied directly towards the immigration dep. as private person. It need to be processed through an agency. It is not a free service provided by the government. Other governments also recognize visa on arrival as a legitimate travel document. "In order to enter Vietnam, you will need a valid passport with at least six months validity and a Vietnamese visa, a visa exemption document, or a written approval letter for a visa upon arrival." To obtain a written approval letter to enter, you must contact a travel agency prior to departure or apply Vietnam visa online at StarVietnamVisa. It is legal, but it is still under beta testing by the government. It need all entry ports (sea, land and air) to communicate and understand each other. All staff and systems need to be integrated. The government has invested in large sum to improve all the systems at each ports. The service is processed and guaranteed by the Immigration Department. Therefore, it is limit support from us compared to visa on arrival, where we have staff inside the 3 main airports. Most cases has been gone well. We do advice visitor to wait to use it until 6 months later or end of 2017. Let the routine to be settled. However, if you know all your travel details and follow all steps correctly, then it should be ok. This visa type has little flexibility, but is easier. Vietnam E-Visa service available that allows visitors from 40 nations (see list below) to apply for a 30 day single entry tourist visa online (Decree No. 07/2017 / ND-CP). More nations will be added in the near future as Vietnam visa policies and procedures are continuously evolving. Only 40 countries are allowed to apply and use e-visa*. See the list below. Can only be used to enter and exit the port that you applied for or there are some risk of penalty/ reject to enter. Not recommend to use at other entry port than the one you applied for. Cannot change entry ports. All applied info need to be correct or risk to get rejected at the entry port/ border. Important to check your info carefully. Follow all the steps correctly. We will of course guide and support you if use our service. If no visa letter, we will cover the visa processing cost and refund in full. No worry. Apply online and pay service fee. We support and guide you. Send in additional documentation and info as requested from us. We can ONLY start processing when all info and documents are received by us. Get your visa letter on email. Check your spam/ junk folder due to users email filters! Use the official letter as travel documents. Get visa stamp into your passport directly at the passport checkpoint. No other fees nor queue to get visa stamp as visa on arrival or visa at embassy. Additional travel details: Exit date, entry port and exit port exactly, copy of reservation tickets and hotels, info about your travel guide/ travel agencies, temporary adr. in Vietnam (and contact info in Vietnam, if you have). E-Visa Eligible Nations: Azerbaijan, Argentina, Armenia, Ireland, Poland, Belarus, Bulgaria, Brunei, South Korea, Germany, Chile, Colombia, Czech Republic, Cuba, Denmark, Timor Leste, USA, Hungary, Greece, Italy, Kazakhstan, Russia, United Kingdom, Luxembourg, Myanmar, Mongolia, Japan, Panama, Peru, Finland, France, The Philippines, Romania, Spain, Sweden, China (not applicable to Chinese e-passport holders), Uruguay, Venezuela, Norway, Slovakia. Please make sure all your details are correctly according to your travel plans and passport. Once you get the visa letter, check it varefully again. Error by the government, will be corrected by immigration dep. without new fees. Mistake done by users, need to re-apply and new service fee. DO NOT use incorrect visa letter, since it is very restricted. In order to enter Vietnam, you will need a valid passport with at least six months validity and a Vietnamese visa, a visa exemption document, or a written approval letter for a visa upon arrival. You can apply it here: apply Vietnam visa online at StarVietnamVisa. How many types of Vietnamese Visa are there? There are two ways of classification: Duration of stay and number of entries. You need to decide before applying for a visa. If you are looking for visa types eg. visa on arrival, visa code at embassy or e-visa* (introduced Febr 2017), then please read other threads in Our FAQs. What is the difference between single entry visa and multiple entry visa in Vietnam? Single entry visa: You are permitted to enter Vietnam ONCE during your visa validity. If you would like to re-enter, you need to apply for new visa. Multiple entry visa: You can enter and exit Vietnam many times during your visa validity. Where to get a visa to Vietnam? There several ways for submitting your application for visa to Vietnam. Traditionally you submit your passport and application through a travel agency or send or deliver direct to your nearest Vietnamese embassy or consulate. This is more expensive, more hassle and less convenient, especially sending in your passport, prepaid postage stamp envelope, money check, application and queue. To apply through the embassy please visit your nearest embassy for more information. You can also apply Vietnamese visa on arrival online through us. It is simple, fast and secure. 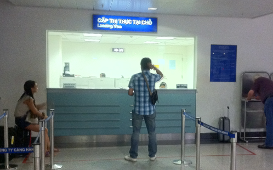 Visa on arrival or landing visa is becoming the more common way to apply for a Vietnamese Visa. There are over 600 thousand applicants using this service every year. Note: Only travelers by air to Hanoi airport, Ho Chi Minh city airport or Danang. Travelers by land or sea will still have to apply through the embassy. What is Vietnamese visa on arrival/landing visa? This is the quickest and cheapest way to get your Vietnamese entry visa for normal passport holder with purpose of tourist or business. You just need to fill in our "Online Application Form", pay the service fee, get your "Visa approval letter" within the chosen processing time and pick up your visa at your destinated international airport in Vietnam. This is widely used and is the more preferred way to apply for a visa to enter Vietnam than the more traditional way through the embassy or consulate. You don’t need to send in your passport or go to the embassy. No hazard, no applying queue, cheaper, faster and more reliable. The Immigration Department receive over 600 thousand Visa-on-arrival applications every year and the number of applicants are increasing steadily as many get to know this Visa option. Note: Only travelers by air to Hanoi airport, Ho Chi Minh City airport or Da Nang. What is Vietnamese visa approval letter? "Vietnamese Visa approval letter" is a pre-approval Visa letter issued by the Vietnam Immigration Department (Vietnam Ministry of Public Security), which supports foreigners to get Vietnam visa upon arrival at Vietnam international airports. Only travelers landing on one of the three Vietnamese International Airport (Ha Noi, Da Nang or Ho Chi Minh City), can apply for this Visa. Before issuing an approval letter, the Immigration Department checks your application thoroughly. Therefore, there is NO chance you will be REFUSED upon arrival in Vietnam if you have obtained an approval letter. However, it is strongly advised that you read our website and follow all the instructions carefully to avoid problems or delays at the airport. What does the Vietnamese approval letter look like? Please see the official Vietnamese visa approval letter sample. Once you get this letter, please check that all information is correct according to your passport, print it out and bring it together with other travel documents. You can also print out the entry and exit form and fill it out before travelling. Please contact us through login and chat or email for any corrections. We can only guarantee cerrecting your information within 48 hours prior to landing in a Vietnam International Airport. Can I use a Vietnamese approval letter for entering Vietnam by land? No, this document is only applicable for those travelling by air through one of the Vietnamese International Airports (Ha Noi, Da Nang or Ho Chi Minh City). If travelling by land, you need to contact your nearest embassy or consulate for submitting your Vietnamese Visa application. How to apply for a Vietnamese Visa on arrival/landing visa? Get the Vietnamese visa pre-approval letter by filling out the secure online form then proceed to payment. We will process the application immediately (within office hours) once payment is confirmed. Within the chosen processing time, you will receive your pre-approval Visa letter issued direct by the Immigration Department in Vietnam. 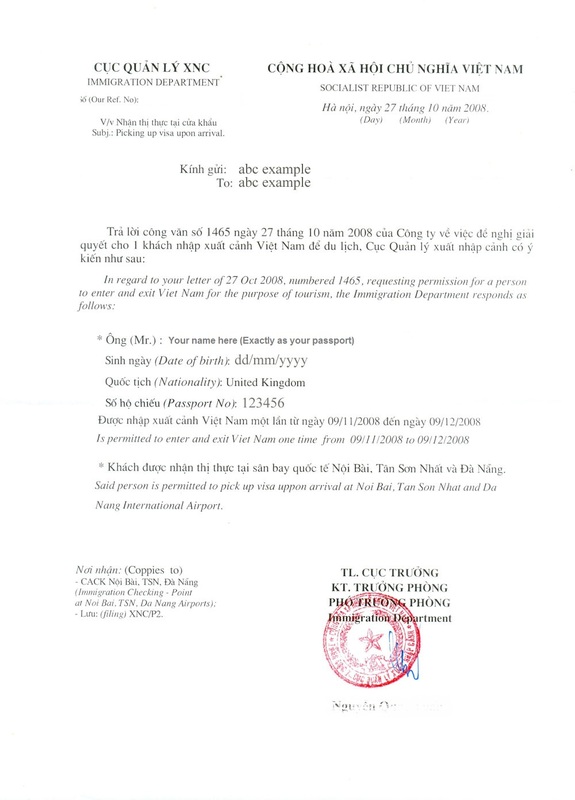 This is a letter confirming that you are pre-approved to get a Visa when landing in one of the Vietnamese International Airports. Print it out and bring the pre-approval Visa letter as travel document. Once landed, go straight to Landing visa/Visa on Arrival – counter. Submit the approval letter together with your passport (at least 6 months validity ), two passport-sized photos with white background and Stamping Fee to Immigration Officers at the airport, the visa will be stamped onto your passport. Please note that there is no ATM inside the airport. Read more about the Vietnamese visa fees. Make sure your name is exactly as in your passport and all the information is correct. You can also print out the entry and exit form and fill it out before travelling, if desired. If you should forget the entry or exit form, you can get it at the airport. Once your application is processing at the Immigration Department, we will not be able to fix any errors. Please contact us through chat or email for any possible corrections. We can only guarantee correction within 48 hours prior landing in Vietnam International Airport. What information do I need to provide to apply for my Visa pre-approval letter? If you choose any extra service (assistant/pick up/fast track services), we need to obtain your flight number and landing date. For further information please see Vietnamese visa fees and prices. How long does it take me to get the Vietnamese visa approval letter? After you have finished your online visa application and payment is confirmed, you will get your visa pre-approval letter via email within the chosen processing time, ½ day office hour (4 working hours, extra urgent service), 1 working day (8 working hours, urgent service), 2 working days (express service) or 5 working days (Normal). You can also log in and download your letter through our website. Where can I get the Vietnamese visa stamp upon arrival? You can get your stamp only in three international airports in Vietnam, Noi Bai International Airport (Hanoi), Tan Son Nhat International Airport (Ho Chi Minh City) and Da Nang Airport. Once landed, go straight to Landing visa/Visa on Arrival – counter. Submit the approval letter together with your passport (at least 6 months validity ), two passport-sized photos with white background, entry and exit form and Stamping Fee to Immigration Officers at the airport, the visa will be stamped onto your passport. Please note that there is no ATM inside the airport. Read more about the Vietnam visa fees. Make sure your name is exactly as your passport and all the information is correct. You can also print out the entry and exit form and fill it out before travelling, if desired. If you should forget the entry or exit form, you can get it at the airport. Once your application is processing at the Immigration Department, we will not manage to fix any errors. Before your application is being processed by the Immigration Department, we can only guarantee correction within 48 hours prior to landing in Vietnam Int. Airport. What documents do I need to show to get the Vietnamese visa stamped upon arrival? Your passport with at least one blank page. No, you cannot. You need to enter on the same or later date of arrival granted in your visa approval letter.Visa dates are not flexible. A visa will be valid from the entry date to the exit date as printed. You can visit and stay in Vietnam any time between these two dates, i.e. you cannot enter Vietnam before the entry date and you must leave by the exit date. Therefore, you should be clear about the DATE OF ENTRY AND EXIT on your application form. Yes, you can enter later than the granted arrival date in the visa approval letter, providing that you exit by granted exit date. What if my passport is expired? Can I apply for a visa to Vietnam? You cannot apply for your Vietnam visa when your passport is expired. In that case, please renew your passport before applying for a Vietnam visa. So before applying visa, you need to check your passport to make sure it is valid for at least 6 months. I am Vietnamese currently living overseas with a foreign nationality, how can I get a Vietnamese visa? Take visa exemption by visiting Vietnam Embassy/Consulate. Further information about Vietnam visa exemption for Vietnamese overseas, please read this Ministry of foreign affairs in Vietnam. If you would like to save time please apply for Vietnamese visa online with us. What are the photo requirements for Vietnamese visa on arrival? Do children travelling with parents need Vietnamese Visa? Visa rules and fees for children should follow the same procedure as adults if they have their own passports. Children who are included in parents’ passports must apply for an approval letter to get visa on arrival at Vietnam airport as adults but they will not need to pay the stamp fee. The parents should sign the applications on behalf of children under 14 years old. Do you require a scan of my passport? In most cases, a passport scan is not required for an online visa application. However, if the Immigration office wishes to verify the information you provide, you are required to send them a scanned copy of your passport. In such cases, we will notify you by email immediately. Note: If you plan to enter Vietnam by land or sea, please visit a Vietnamese embassy to get your visa. Visa on arrival works if you arrive at any of the three international airports: Tan Son Nhat (in Ho Chi Minh City); Noi Bai (in Hanoi) and Da Nang (in Da Nang). There is no problem with switching between these three airports. Send us an email to sales@starvietnamvisa.com with you order-id or by replying to the email confirming your order, and we will do the correction. How much does it cost to get Vietnamese visa on arrival in total? It depends on the type and length of the visa you are applying for. In general, there are two fees you are required to pay: The stamping fee (paid directly at Vietnam's airport) + our service fee for the approval letter (paid in advance). Service fee: This is a fee paid in advance for processing your application at the Immigration Department. Stamping fee: You pay in cash directly to Vietnam Immigration Officers at the Landing Visa counter to get your visa stamp in your passport. In any visa to Vietnam you have to pay two kinds of fees (service fee and stamping fee). The differences is the service fee and who you pay it to. We process directly in vietnam, and that is why we are cheaper than all embassies and fastest. As a leading agency, we also have very low price and high quality on our services. At the embassies you pay both fees at the same time for regular visa. With Visa Code, you pay service to the agent (starvietnamvisa), and stamping fee to the embassy when picking up the visa stamp. With Visa on arrival, you pay service to the agent (starvietnamvisa), and the stamping fee to the immigration dep. at the airport. For detailed information please read about our Vietnam visa fees. The stamping fee is the fee you are required to pay at the Vietnamese airport in order to get the official visa stamped in your passport. The stamp fee must be in cash, no credit cards are accepted. There is no ATM on this side of the Passport Control. 45 USD/person for 1-3 month single entry visa. 65 USD/person for 1 month (29 days) multiple entries visa. 95 USD/person for 30 days to 3 months multiple entries visa. 135 USD/person for 6 months or more multiple entries. The total price will still be cheaper than at any embassies. We will still keep our service fee low. The Visa Stamping fee is regulated by the government and has been decided to be increased from 1st January 2013. Everyone who enter Vietnam from this date has to bring the visa stamping fee for 2013. We currently accept Debit/Credit cards and PAYPAL for payment of our approval letter service fee. These include: Visa, MasterCard, American Express, JCB and Diners Club. The card expiration date was entered incorrectly. Your Visa Verified password/MasterSecure Code was entered incorrectly. For secure online payment, we use certified Secure Socket Layers (SSL). At no time is your debit/credit card details transmitted unencrypted over the internet. For further information, please refer to our privacy statement. You can pay for the approval letter after you submit your application. If you have problems with payment, email us at sales@starvietnamvisa.com with your order-id and we will send you a link to follow in order to pay. Keep in mind that no application can be processed until full payment is made. What should I do if I entered the wrong passport number or other details? Shortly after you submit your application, you should receive a confirmation email at the email address you provided us with. In this email we confirm the information you entered earlier. If you find any mistakes, please contact us right away by sending an email to sales@starvietnamvisa.com. How can I change my order(s)? Once the application is with the Immigration Department (Order Status “Processing”), there is no possibility of any change. If the status is not in the “processing” state, please send an email to sales@starvietnamvisa.com with your order-id. Or log in and chat with us during office hours, in order for us to make the correction before processing. It is therefore very important that you check your order before confirming. We work directly with the Immigration Department and your Visa application will be transferred within a very short time. The process is automated, so even when not within working hours, we would need the correction within a very short time. The Immigration Department operates with a no refundable policy. How do I check my Vietnamese visa approval letter processing status? Order not paid Your application has been submitted, however your payment has not yet been completed. Your Visa application will start processing once payment is confirmed. Processing Your visa application is being processed or sent to the Immigration Department for further processing. Completed Your visa application has been processed successfully and the visa approval letter has been finished and uploaded on our site. On Hold Your visa application has some problems due to misspelling, incorrect information or not valid data. Please read your email for further details and contact us as soon as possible so we can help you through the process. Declined Sorry, your visa application has been declined by the Vietnamese Immigration Department. If you have been declined Vietnamese Visa before, you cannot apply for Visa on arrival. Contact your nearest embassy or consulate for further guidelines. Please contact us through email at support@starvietnamvisa.com for details about money back guarantee. We use and recommend payment through Paypal.com. PayPal deliver one of the most secure payment platforms in the world. They use fraud prevention technology that monitors transactions for suspicious activity. They have a team of over 2,000 specialists including former law enforcement officials, working to protect you from fraud and identity theft. They ensure users who send or receive large amounts of money, have successfully completed our verification system and identity check. Safeguarding your financial and personal information is one of their most important priorities. That's why we automatically encrypt all sensitive information sent between your computer and our systems, ensuring your information is kept private. When registering or logging in to starvietnamvisa.com and making the payment, we verify that your Internet browser is running Secure Sockets Layer 3.0 (SSL) or higher. Information is protected by SSL with an encryption key length of 168 bits (the highest level commercially available). Paypal store your personal information and ensure it's heavily guarded, both physically and electronically. To further safeguard your debit and credit card numbers and your bank account details, they do not directly connect their firewall-protected servers to the internet. And we don’t save in any case your personal debit and credit card on our server. All payment details goes through the Paypal system. For questions such as: who is exempted from a visa, or obtaining Vietnamese visa in different countries, please visit our visa information center. You can also email us at support@starvietnamvisa.com - one of our Customer Support members will reply within 2 hours during business hours and within 24 hours outside of office hours of Immigration Department in Vietnam. Note that We follow Vietnamese time zone. Note: Though our working hours are from 8.00 to 16.00, the website service is available 24/7 and is fully automated. Therefore, you can still apply for a visa even outside office hours in Vietnam.